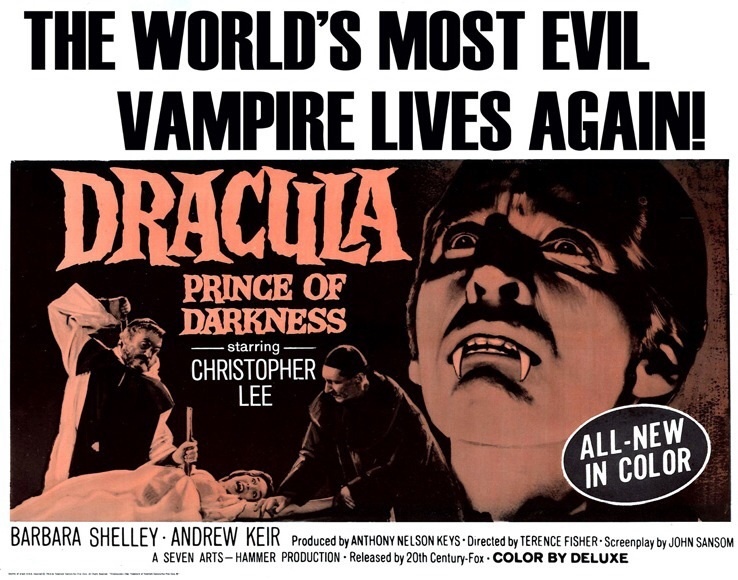 Cinema Sunday: Dracula: Prince of Darkness (1966) | Magazines and Monsters! ← Marvel’s Unsung Heroes! -Don Heck! I’ve decided after last week’s review, to continue with Hammer’s Dracula franchise, and give Dracula: Prince of Darkness a look! Now, this film is actually a continuation from the first film (Horror of Dracula in the U.S.), and keeps the ball rolling with the greatest Count Dracula- Christopher Lee! He reprises his role as the venomous vampire, and really cranked up the crazy in this film! It’s definitely one of my favorites in the sub-genre of vampire films! Well, without further delay, here we go! The film begins showing stock footage of Van Helsing (Peter Cushing) killing off Dracula from the first film (to get you back on track after The Brides of Dracula). Next, a funeral procession is moving through the forest, and seems to be ready to do something terrible to a girl that has just died. As they are about to put a stake through her heart, a monk, Father Sandor, (Andrew Keir) is passing by, and whips out a hunting rifle, and puts a shot near them, stopping them from staking the corpse. He tells them that they’re fools, and they explain that they cannot take any chances with suspicious deaths. He again calls them idiots, and orders them to bury her in the church yard. In the following scene, the local tavern is bustling with patrons, and four of them specifically are spotlighted. These four travelers are having a good time, all except Helen (Barbara Shelley). She thinks that her brother in-law, Charles Kent (Francis Matthews), is being foolish with his money by buying drinks for everyone at the bar. They disagree about the subject, but as they are about to leave, the door swings open, and Father Sandor (image below of Andrew Keir & Francis Matthews) steps inside. He greets the travelers, but scoffs at the locals for having garlic to “keep out the boogeyman”. The locals seem like they couldn’t care less, and keep pounding down the ale. Father Sandor asks them to come visit the monastery when they travel his way, but warns them about their next destination. He tells them that evil abounds there and that they should avoid it altogether. The next morning, the foursome is taking a carriage ride to their next stop, in Carlsbad. Once it nears sunset though, the driver stops, and orders them to get off of the carriage. They do, but can;t understand why he has asks this of them. He drives off after telling them he’ll be back in the morning. As they quibble about what to do, another carriage, all black, pulls up to them. 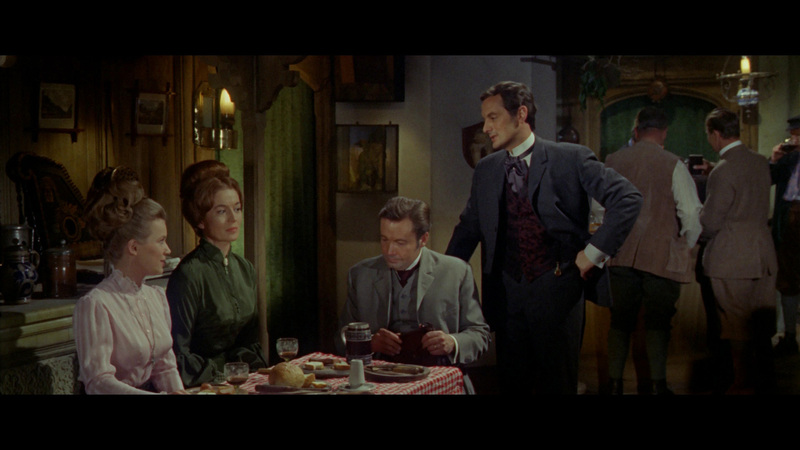 It has no driver, and this scares Helen, but Diana (Susan Farmer), Alan (Charles Tingwell), and Charles all agree they should use the carriage to get to Carlsbad. Once in the carriage though, it takes off and wont follow the instructions of the driver. It arrives moments later at a less than auspicious castle in the hills. Once they decide to go inside, which is against the warning s of Helen, they are not greeted by anyone, and can find not a single soul at home. The dinner table is set for a meal though, and all the candles are burning. The men go upstairs to search for someone, and as they do the ladies are shocked to see the shadow of an odd man coming towards them. They shriek in terror, but when the men come back downstairs, they all realize that it’s just a servant. The man identifies himself as “Klove” (Philip Latham), and tells them that his master always has a table and rooms waiting should any passersby need help. Helen is irked by Klove and the house, but the others think she’s being a wuss. Klove tells them about his former master, Count Dracula, and how great of a guy he was back in the day. After a nice meal, they retire upstairs for the night. As the two couples are bedding down for the night, Helen still has an uneasy feeling about the situation. Everyone goes to sleep, and Helen cries out, thinking someone has called her. Alan tells her she’s been dreaming, but then he hears something in the hallway. As he peeks out, he sees Klove, dragging a trunk through the hall to a room. As he leaves to investigate, he follows Klove into a lower level. As he sees a coffin placed in the middle of a room, Klove pops out from behind him, and stabs him to death. Klove then hoists the corpse over the coffin, which we can now see is full of ashes, and slits Alan’s throat, spilling the blood all over the ashes. As the ashes turn to smoke, then to an eerie fog, we get a feeling of dread. As the fog clears, we see Count Dracula, reborn! Before he can even get his bearings, Helen, who has gone looking for her husband, reaches the lower chamber. Before she knows what’s going on, she’s hypnotized by the gaze of the Count! He then moves in for the kill. After this wild night, Diana and Charles are befuddled by their missing family members. Charles searches for them diligently, but cannot find any trace of them. Charles takes Diana to a nearby woodcutter’s shack, and returns to the castle to look for them again, and more in-depth. A while after he’s left, Klove pulls in with the carriage and tells Diana that Charles asked for him to come and get her. Meanwhile, Charles has discovered his brother Alan’s dead body. Klove then returns to the house with Diana, and Helen, who’s now a vampire, attempts to bite Diana, but is interrupted by Dracula! He hisses at Helen and grabs Diana, but Charles shows up, and fights them. Diana then uses the cross to send them packing for now. Charles and Diana then make for the monastery where Father Sandor lives, and tell him the horrible story. He agrees to help them fight Dracula and his minions, but first they must fight off an attack on the monastery itself! Can they defeat the Prince of Darkness? Or will they become part of his undead army?!? If you love vampire/Dracula films from back in the day, you’ll love this flick. Lee gives a chilling performance in this one, and his lack of dialogue doesn’t hinder the creepiness of his character. After the second film not having Lee in it, this was a great return for him, as the previous vampire (David Peel) was also pretty good. Barbara Shelley was also quite good in this film, adding the “nagging wife”, but also giving the movie some of that eeriness by being so frightened. Her performance was very believable. Another fine role was that of Klove. He was supremely weird and creepy, giving us all something to shudder about! I think the best acting role was by Andrew Keir (Father Sandor). He was hilarious when the need was there, but also very serious and tough as nails as well! A scene where he had to clear up a vampire bite on Diana’s wrist. He holds a scolding hot lamp on it, and then stakes a vampire through the heart later in the movie! Overall, I’d give this one high marks for the roles, and for the music score too. James Bernard is probably the best Hammer composer of all time, and rightly so should he be labeled. Always thunderous, and oft his music sets an ominous tone for the entirety of the films he composes! Kudos to the regular gang of people as well that also were involved -Jimmy Sangster, Anthony Hinds, Anthony Nelson Keys, Terence Fisher, etc. Get out there and grab this flick, it doesn’t disappoint! Pingback: Cinema Sunday: The Frozen Dead (1966) | Magazines and Monsters! Pingback: Cinema Sunday: Quatermass and the Pit (1967) | Magazines and Monsters!